Kids get a lot of things right. They take naps in the middle of the day. They use cartoons as motivation. They wear plaids with polka dots. And they solve all of life’s major dilemmas by playing Rock, Paper, Scissors. Rock, Paper, Scissors, believe it or not, did not originate on the schoolyard but in ancient Asia or Africa. There is some debate about it’s actual origins. If only there were some way to decide which continent it started on… Anyway! This zero sum hand game is hella old and is responsible for settling many a dispute over the centuries. As a tie-breaker it’s more interactive than a simple coin toss, less labor intensive that drawing straws, and doesn’t require that you carry dice around with you at all times. And, perhaps best of all, it lends itself to endless variations. To win a hand, rock beats scissors, scissors cut paper, and paper covers rock (meaning rock must be claustrophobic because that's really the only way we could see paper actually defeating rock simply by covering it up). If you have two hands, you can play this “game” anywhere, anytime. You can use it to decide what movie to go see, where to eat dinner, or who should take out the trash. It’s the ultimate relationship counselor because it’s unbiased. Also, it lets you know if your partner is a sore loser/winner in short order. We are dying to see a group of adults play any of these three acting-skills-required versions. Our personal favorite, however, comes courtesy of Sheldon Cooper (aka Jim Parsons) on The Big Bang Theory. 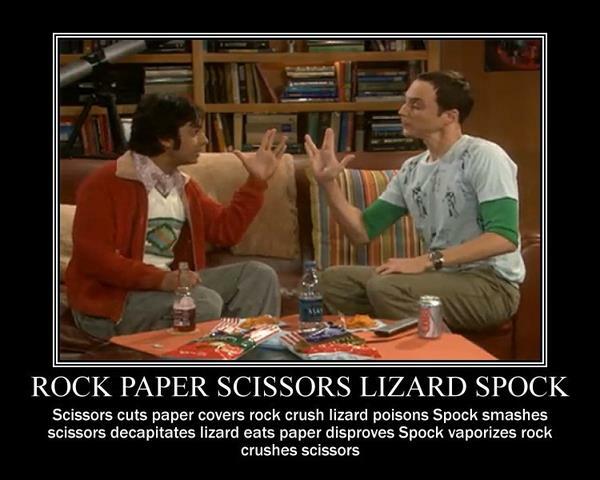 If you can remember the rules, try your hand at Rock, Paper, Scissors, Lizard, Spock* (scissors cuts paper, paper covers rock, rock crushes lizard, lizard poisons Spock, Spock smashes scissors, scissors decapitates lizard, lizard eats paper, paper disproves Spock, Spock vaporizes rock, and, as it always has, rock crushes scissors). Sheldon didn't invent this one (Sam Kass and Karen Bryla did), but his explanation beats all others. Or if you want to get seriously serious about it, you can take part in a World RPS Society tournament. Yes, this is a real thing. Fun fact: the Guiness World Record for the largest tournament was achieved by Oomba, Inc. at Gen Con 2014 in Indianapolis. See, it’s not just for kids, it’s also for grown-ups who like to act like kids. We can relate. And now we leave you with this picture of the Rock Paper Scissors sculpture by Kevin Box. Leave a comment below to tell us the best thing you ever won playing Rock, Paper, Scissors or how you plan to use this game in your regular, adult life.